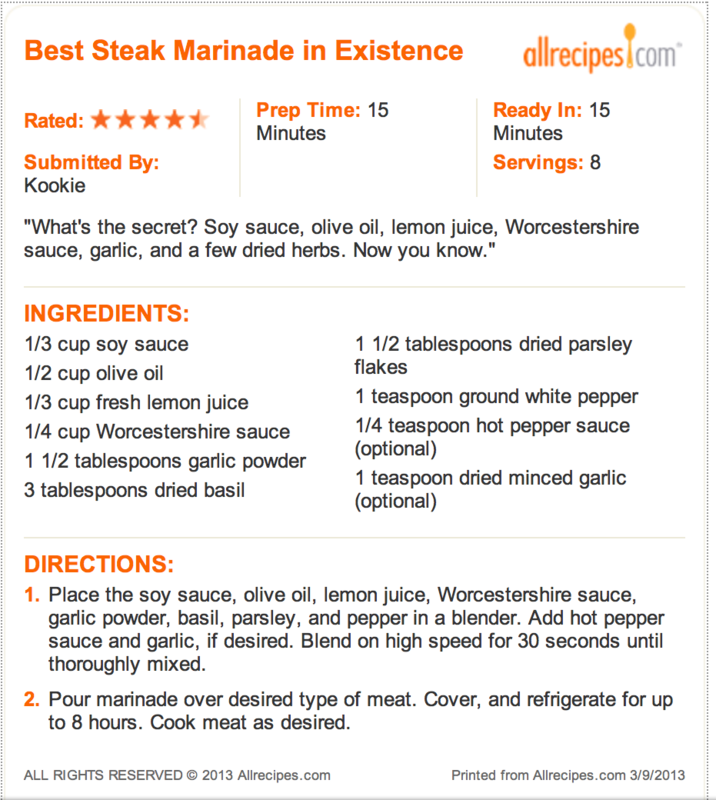 “The Best Steak Marinade in Existence” is a steak marinade that is hugely popular on food blogs and pinterest boards. I had pinned this recipe a few months ago and was just able to try it for this first time this week. First, let me attest that this IS one of the best steak marinades that I’ve ever tried. I did not use all the ingredients (some of the dried spices), but that did not affect the fabulous flavor in the least. I actually don’t know how adding anything more could have made this marinade any better. Here is the recipe taken from allrecipes.com. For those of you who love reading reviews, you can click on the site to read over 1,200 ratings for this recipe! I followed the recipe exactly through ingredients 1-5 (soy sauce through garlic powder). Instead of dried minced garlic, I minced 4-5 cloves of fresh. After mixing this together, I poured over filet mignons and refrigerated for about 5 hours (turning over after several hours to coat both sides). The filets were absolutely fabulous! This marinade added a wonderfully rich, deep flavor to the meat that the whole family loved. It is very pronounced with a salty, tangy bite. If you prefer a sweeter, Polynesian flavor, you might want to try another of my all time marinade favorites, the Kensington Club Steak Marinade. So……this pin was worth it; it absolutely is a keeper! Let me know if you try it and what you and your family think.